Natural dust and anthropogenic dust have adverse impact on local environment and human health. 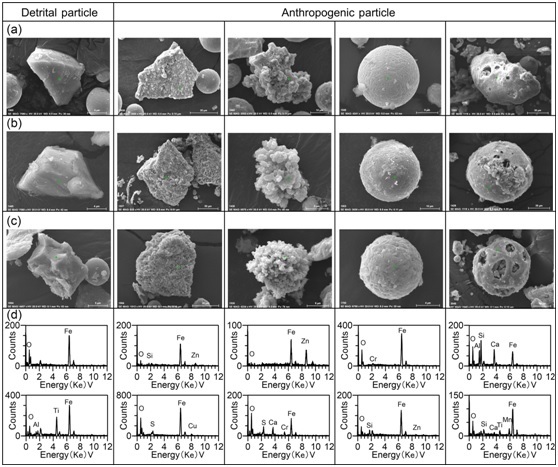 Consequently, it is important to distinguish the characteristics and contributions of natural and anthropogenic dust in urban aerosols to formulate effective policies for dust pollution abatement and improving air quality. Urban dust aerosols, comprising both natural and anthropogenic contributions with complex morphological and physiochemical characteristics, have become a focus of studies of global climate change and regional air pollution. Previous studies mainly focused on pollution levels and sources by using environmental magnetic techniques. However, there are no studies that systematically compare natural dust, urban dust aerosol and polluted dust from source-to-sink. Recently, a research team led by Prof. SUN Youbin from the Institute of Earth Environment (IEE) of the Chinese Academy of Sciences suggested the contributions of local anthropogenic and distal natural sources to urban atmospheric dustfall can be quantitatively estimated. Their findings were published in Atmospheric Chemistry and Physics. 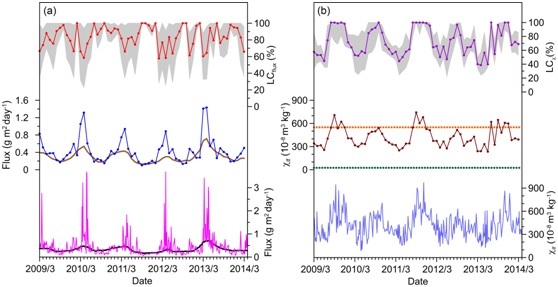 This study systematically collected atmospheric dustfall in Xi’an (over five consecutive years, 2009-2014), surface sediments from potential dust sources in East Asia, street dust, and anthropogenic pollutants such as vehicle exhaust and fly ash. The dust flux, magnetic parameters, and magnetic particulates’ morphology and elemental composition were analyzed to facilitate a thorough source-sink comparison. The study revealed a significant inverse relationship between seasonal variations of dust flux and magnetic susceptibility (χ). By comparing dust flux and χ records, the relative contributions of dust from local anthropogenic sources were estimated. The local anthropogenic contribution also showed a clear seasonal variations, which decreased in spring and increases in other seasons. Analysis of Scanning Electron Microscopy (SEM) combined with Energy Dispersive Spectroscopy (EDS) indicated that the anthropogenic particles have angular, spherical, aggregate, and porous shapes with distinctive contributions from marker elements, including S, Cr, Cu, Zn, Ni, Mn and Ca. The detrital magnetic particles originating from natural sources were characterized by relatively smooth surfaces with no marker elements induced by anthropogenic. This research demonstrated that this multidisciplinary approach was effective in distinguishing dust derived from distant natural sources and local anthropogenic sources, and for quantitative assessment of contributions from the two end-members.